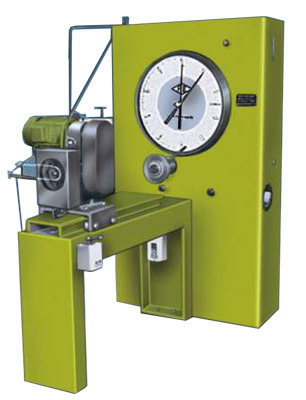 Torsion Testing Machine is designed for conducting torsion and twist on various metal wires, tubes, sheet materials torque measurement is by pendulum dyanometer system. Torque ranges can be adjusted by auto torque selector. Torque can be applied to specimen by geared motor through gear box. Autographic recorder gives the relation between torque and angle of twist. The accuracy of torque indication is ±1of the true torque. Machines upto 25000 Nm. Capacity will be available on special enquiry. FIE reserves the rights of change in above specification due to constant improvements in design.